Sometimes, cyclists are their own worst enemies. The people who should be most enthusiastic about building a better environment for cyclists, in which cycling is safer and quicker than the alternatives, and therefore attracts more people to cycle, are instead those who object to the construction of the facilities which would make this possible. This is an interesting one. People believe that the run-off from a cycle path will cause drainage problems. 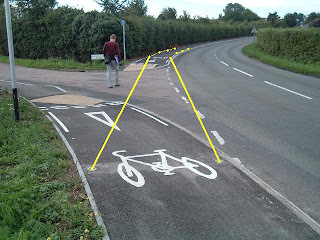 The cases which I have in mind were discussions in Cambridge about surfaces for new cycle paths. Some campaigners were asking for soft and porous surfaces on cycle paths on the grounds that these would be less environmentally destructive than asphalt or concrete. Roads are always surfaced with asphalt or concrete, causing just the same drainage problems. However, these are built with a wider surface. Roads add the problem of run-off containing oils and other fluids from the vehicles using them. The level of maintenance needed is much higher than that of a cycle path because heavier vehicles destroy the surface they run on much faster than do lighter vehicles. Seen as an alternative to an additional lane on a busy road, even the best quality of cycle path uses fewer resources and causes fewer drainage problems. 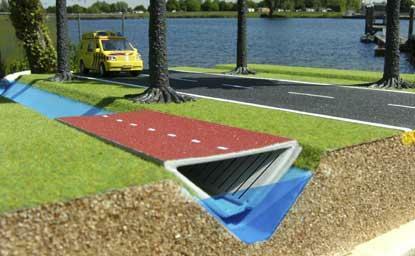 It is possible to construct a cycle path so that it also acts as a drain. For these reasons, the drainage argument makes no sense. Cycling should be encouraged for many reasons. A surface which makes cycling more difficult, or indeed becomes slippery or difficult to ride on when wet does not encourage cycling. A related argument, from the same place, was that proper lighting on a cyclepath would produce excessive light pollution. Specifically I remember this as an argument about a cyclepath which would parallel the A14 - a very busy road near Cambridge. kerb from riders and caused crashes. This makes no sense for much the same reasons as the drainage argument makes no sense. Any possible harm caused by cycle path lighting is much smaller than that caused by existing lighting and vehicle headlights on the parallel road. Every person riding a bike uses headlights which cause less light pollution than if they had been driving a car. If the cycle path is successful enough that road expansion does not go ahead, then the savings can be far greater than the costs. Here in the Netherlands, energy usage and light pollution by cycle path lighting is minimised by both use of LED light fittings and dynamic cycle path lighting which turns on only as it is needed. Not all cycle paths have to be lit at all times. However, Good lighting in some locations is essential not only to make sure that cyclists can see where they are going but also to overcome problems of low social safety. A third argument, used quite recently by campaigners in Cambridge to argue against building better provision for cyclists was that old trees would have to be removed. In the particular case, the concern was about trees which had been standing since the 1930s. There are several reasons why this argument also doesn't stand up. I was told as a child that money "didn't grow on trees". However, the one thing which certainly does "grow on trees" is of course trees themselves. Cutting urban trees and replacing them causes only a temporary change. Eventually, any urban tree will become too large and need replacing. This is an ongoing process in all cities. It happened right outside our home when we lived in Cambridge. To bring forward the replacement of a few trees to enable construction of top class cycling provision (as in the photos on the right) benefits the environment. the new trees already look good. There is a specific problem in Britain of both the cities and countryside losing trees. However, that must be addressed by campaigning in other directions than specifically against cycle paths. The Netherlands manages to plant a lot of trees and to build cycle paths. Indeed, Assen is built around six woods, one with trees dating back to the middle ages. There is a strong policy for tree planting which has no equivalent that I'm aware of in the UK. From a hill you can see how green Assen is. The many cycle paths have not had a negative effect. Cycling is often promoted as "good for the environment". Often cycling campaigners are also interested in other environmental issues, and that is of course a good thing. However, the bulk of the population are not "hair shirt" environmentalists willing to make compromises in comfort when they cycle. A high standard of provision is required to attract those not predisposed to cycling to take part. The average person needs a higher level of subjective and social safety than "cyclists" need. They won't cycle if it is something which is endured rather than enjoyed. The good news is that cycling remains both beneficial to the environment and also cheaper than the alternatives even if cycling facilities are built to a high standard. If cycling is to reach out from the few to become something which is truly for the masses then it must be attractive and inviting. It must offer a level of comfort as well as offering direct and efficient journeys. Building cycle facilities to a lower standard, whether to save money or because it is more "green" is a false economy. There are many myths and excuses sometimes used to explain why there is little cycling elsewhere. Many people find it easier to propagate these than to face the real reasons. Many times the "green" arguments against cycle infrastructure are used by those who are not green at all themselves. It is just a convenient point to prevent any improvement for non-motorist activity. If it causes some cyclist advocates to hesitate since they are environmentalists then all for the better in the mind of some. Those arguments sound ridiculous - especially when you compare to the alternative - really wide roads for motor vehicles (as you rightfully point out). I haven't heard anyone use those particular arguments here in Canada. One argument against infrastructure from cyclists here is that it will slow cyclists down (which is also a lame excuse, easy to debunk, and not very common). "If we give space to bikes, won't that just cause more congestion for motorists, and result it more pollution by car idling, thus being bad for the environment?" There's one bike/foot path in Bristol which has LED lights, which works because it is through some dark allotments and there is no major street lighting to distract. You still need bike lights, but the LEDs show you the path and help you see pedestrians ahead early (as they block the lights). I think it benefits people on foot or cyclists without lights more than anything else. What it does do is say "you are welcome", instead of having an unlit trail of darkness that nobody wants to go along unless they have to. I have never encountered a green reason for not having a cycle path - it is normally just "too much money to spend on too few people" - but that is not to say there will not be some genuine environmental cases. I did stop to think when I saw the route across the heathland last week and I would not be happy to see a tree cut down to accomodate a cycle path any more than a car park. Urban trees are still trees. The UK does have tree planting policies and they can be very damaging to other habitats, the UK also has some of the oldests trees in Europe, my local Tortworth Chestnut is a gem. It is not the planting that needs regulating so much as the cutting down. It is a sure thing that you can provide a cycle route where a road for cars would be inappropriate, but that has never stopped anyone from putting a motorway through Twyford Down etc. Porous surfaces don't reduce the risk of flooding, they act to reduce surface water and spray. They dry out quicker so might act to encourage fine weather riders. I don't mind lights along busy cycle routes but I also enjoy a ride under a full moon without lights along our country lanes, but the uncommon cats-eye type lights are often more of a hazard than a benefit so need to be used sparingly if at all. I've never heard of the flooding or lighting arguments here. The tree one I have on a rare occasion, however one road that is currently under construction where I live, residents complained about the removal of trees. No bike lane in the area and no plans on one. I'd rather see cities be able to work around trees if possible rather then take them down. My current street never had trees along it until it was resurfaced and bike lanes were added. City ended up planting a few hundred! I'd agree with James. In Canada the most common excuse against proper cycle infrastructure is that it will slow down cyclists. I do hear often from motorists, that it's "not green" to take away a lane or two from cars for bike lanes, as it will cause more traffic back-ups. I think the "save the trees" argument is typical. This is why people dislike invironmentalists. What many fail to understand is that it's not a choice between cutting down trees or not cutting down trees. It's a choice between the benefits of a tree, or the benefits of a bikepath. Both have environmental implications, and in some instances cutting down the tree (even the very old one) is the "green" thing to do. Many socalled environmentalists are unable or even unwilling to face this reality. Rather, they're environmental sentimentalists, who merely frustrate actual environmentalism, and squander it's credibility. They are like the PETA people who want to save the animals, but only the really cute and adorable ones. Yeah, here in Vancouver the rhetoric seems to be that having a bike lane would create gridlock so more cars would be idling causing more air pollution. It's really a failed approach because it comes off as desperate. Also it assumes that people who cycle have saving the planet as their motive for cycling. I wonder if then that them driving a car is specifically to destroy the planet and is their reason to drive. In some milieus, not destroying the planet's ecosystem is considered to be a non-masculine, flaky, weakling thing. To them "real men" damage things. And we have a famous lumberjack song. We should not invest even a dime in bike infrastructure. Peak oil is around the corner and gas prices will wipe the cars out the streets which will be ours to enjoy once again. We only sit and wait and use all that money for other green issues. Peak oil means energy is going to be really expensive, so the streets will be entirely empty except for rich guys in sportscars driving really fast (cos there's no other traffic, or so they presume). What is the mechanism for enforcement of environmental rules and regulations? In the US both the government and private parties can sue to enforce environmental rules. The assumption was that with both public and private parties able to enforce environmental rules through the courts, environmental rules were more likely to be strictly enforced because private parties could step in if the government failed to act. But it created a lot of Baptist and Bootlegger problems. One of the best ways of keeping property values high is to prevent new development. As a consequence neighbors who fear new development sue challenging the adequacy of the mandatory environmental impact report. Arguing that a new development they disapprove of shouldn't have been approved because developers failed to adequately disclose adverse environmental impacts of the new development. Then if necessary they make some type of spurious environmental arguments such as a bicycle paths as some sort of threat to the environment. These types of bogus environmental lawsuits work even when they fail because they ultimately just increase the cost of new development and keep new development out of areas where the locals don't want it. But I assumed that things in Europe worked a little a better. And besides, car infrastructure has caused many more trees to be removed and I can't think of a single thing that built bicycle infrastructure to cause a home or building to be removed. Many road projects have, like the razing of 40 city blocks in Minneapolis to build a freeway. People weren't too concerned then about much more damaging infrastructure. Why can't we rectify our mistakes about abusing cars. Note that the Dutch government has made a goal to cover 100% of the motorway network (also may include the autowegs) with porous asphalt concrete, which rapidly drains water. You can see videos of thousands of litres of water (I hope they just got some lake water rather than the filtered stuff, nobody needs to drink it after all) to dump on the asphalt as a demo. I think that rainwater will drain just fine, and floodwater probably will too so long as the sea level doesn't rise too much.